Each year the Retired Teachers Chapter of the Boston Teachers Union awards three scholarships to deserving high school seniors who are children, grandchildren, nieces, nephews, grandnieces or grandnephews of RTC members. One of these scholarships is earmarked for a student who chooses to attend a vocational school or equivalent institution. Applications for these scholarships can be picked up at the RTC/BTU offices at 180Mt. Vernon Street, Dorchester, MA 02125 or they can be downloaded from the BTU website. The deadline to apply is April 1, 2019. Envelope must be postmarked by this date. Eligible student should fill out the Request for Application: bit.ly/unafraidscholarship. After filling out the form, students should check their email. A scholarship application will be shared with them within a week. 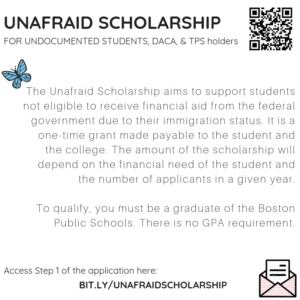 Please note that this year we have extended the scholarship to any BPS graduate who is undocumented, DACAmented, or a TPS recipient. Inviting all BPS seniors who are planning to study one of the creative arts and/or to pursue a career in teaching to apply for a $1,500 scholarship! Apply online today. Completed applications are due by March 8 at 11:59 pm. For additional info or questions, please call Claire Radley at 617-680-1460 or email BostonRGTC@gmail.com.